Veterans of America's wars, from World War II of 1941 to Afghanistan of 2012 (and most likely beyond), open their hearts and their souls and share their personal stories of sacrifices made, battles fought, victories won, defeats suffered and companions lost in defense of the United States of America and the American way. Told in their own words despite anguish, tears and sufferings, the veterans allow the writing team of J. Jackson Owensby to record their nightmarish unending ordeals as they fight, bleed and even die to protect the freedom and liberty that every American citizen enjoys. These unknown and unsung brave heroes-men and women-make their sacrifices so that we-you and I-can continue to live in the Land of the Free and the Home of the Brave. Proceeds from the sale of the book benefit The Veteran Memorial Foundation in King, N.C., a non-profit organization to aid homeless and unemployed veterans and their families. Veteran of the United States Air Force and widely published contributor to newspapers and magazines, J. Jackson Owensby is ever a student of man and man's actions and reactions. Owensby created the America The Great, a series that explores the history of the United States from it's earliest days and covers many of the great men and women and events that have shaped this great nation from its inception until the present. Now, together with his son, the noted father-son writing team of J.Jackson Owensby has embarked on a new task, creating a series entitled Unsung Heroes of America. 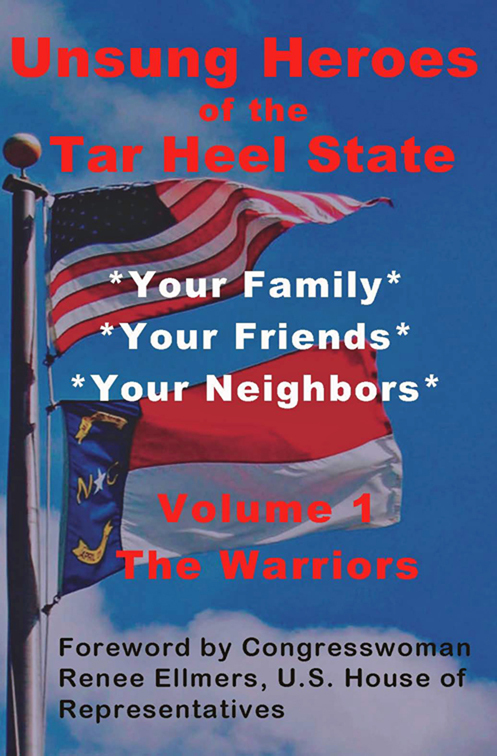 Book One of the series is entitled, Unsung Heroes of the Tar Heel State - The Warriors - Volume 1. The book, and others to follow, contains the personal stories of veterans of the wars of the United States from World War II through present-time war in Afghanistan. Recorded in the veterans' own words obtained through face-to-face interviews, the stories relate the sacrifices and odeals that the veterans suffered and the difficulties they face even as they return to their families and civilian life. With a foreword by Congresswoman Renee Ellmers, U.S. House of Representatives, North Carolina 2nd District, the first in the series is programmed to be released on Veteran's Day, November 11, 2012. Other titles are scheduled each half-year.